Syn-dicate was the brainchild of Neil Ryan and was his attempt at 'rockabilly - disco fusion'. Whatever you think of it, it's all quite entertaining, and 'Rapabilly boogie' turns out to be a tribute the The Wild Wax Show and Radio City. Excellent.... 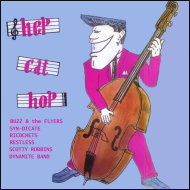 These recordings date from 1982, and were originally issued on a 7-inch single (REBOP501), a copy of which would cost around $25/£14.